The GOP candidate invested in 10 Chinese companies recently—including ones that embezzled, partnered with Iran, and stole US trade secrets. On the campaign trail, Mitt Romney rips President Obama’s policy on China and talks tough against the rising global power. “We’re going to crack down on China,” he said at a recent event in Ohio. “They’ve stolen our jobs; that’s gotta stop.” But according to Romney’s recent tax returns, between 2008 and 2011 Romney invested more than a half million dollars in the stocks of 10 Chinese companies—including firms that embezzled, partnered with Iran, and stole US intellectual property. Through Romney’s individual and family “blind” trusts—managed by his personal lawyer, R. Bradford Malt—the Romneys traded more than 25,000 shares in Chinese firms, including some based in Hong Kong. Some of these investments have previously been reported in the media and raised by the Obama campaign, but others have gone unnoticed. Overall, the stock investments netted the Romneys a profit of more than $90,000 in 2010 and 2011. (Some of the individual investments were losers.) While that sum is a pittance in light of the candidate’s vast personal wealth, it represents a significant amount for ordinary working Americans. Romney has long invested in China, putting millions into Chinese firms back when he ran Bain Capital, as MoJo‘s DC bureau chief David Corn first exposed in several reports this summer. “Gov. Romney believes China should be labeled a currency manipulator,” his spokeswoman said recently, “and he will move to label them as such on Day One.” Yet the candidate invested in Industrial and Commercial Bank of China, the country’s largest bank. Some experts say that China’s central bank still exerts power over ICBC (which was privatized in 2005) to carry out the country’s monetary policy. The Romneys invested in more than $80,000 worth of shares, ending with a loss of just over $5,500. The Romneys invested more than $78,000 in this Hong Kong-listed company, China’s largest public port operator. Its parent company, China Merchants Group, is one of the longest-running state-run corporations in China. They sold the shares at a loss of about $6,500. 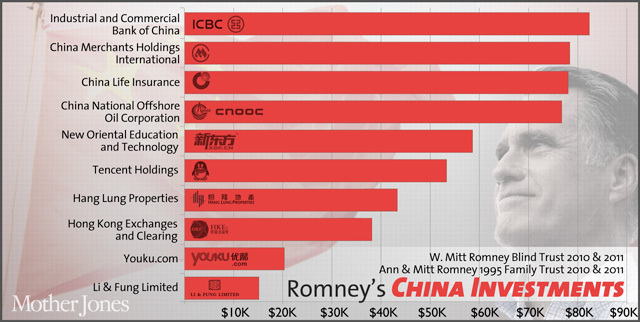 About a fifth of Romney’s China profits came from China Life Insurance, the mainland’s largest life insurer. In 2009, according to news reports, China’s National Audit Office found that the firm had embezzled nearly $172 million—overstating sales, improperly settling claims, and lining executives’ pockets with millions of yuan. The following year, the Romneys made more than $20,000 when they sold their shares. The Romneys invested nearly $77,000 in China National Offshore Oil Corporation from 2009 to 2011—even as US sanctions called for divestment of companies that do business with Iran’s energy sector, as CNOOC does. The Chinese oil giant’s parent company is helping Iran develop the North Pars natural gas field in a deal estimated to be worth $16 billion. The Romneys sold their shares in CNOOC for a profit of more than $15,000. Campaigning in Virginia recently, Romney said of Chinese companies: “They steal our technology, they hack into our computers—they also steal our know-how, our patents.” But the Romneys also invested in New Oriental, a company infamous for stealing copyrighted exam questions from a US firm. In 2001, New Oriental was sued by Educational Testing Service for stealing and distributing proprietary test questions for admission to US universities. A Chinese court ordered New Oriental to pay over $1 million, a sum reportedly reduced in 2004 by Beijing’s High Court. The Romneys made more than $20,000 from the nearly $60,000 they invested in New Oriental shares. A leading real estate developer in Hong Kong and mainland China, Hang Lung is now investing $8.5 billion on the mainland. The Romneys invested $43,300 and profited $22,600 when they sold their shares. The Romneys made their largest profit on the money they put into Hong Kong Exchanges and Clearing, the holding company for the Hong Kong Stock Exchange: $30,600, on an investment of approximately $38,800. A labyrinthine supply chain manager for US companies including Toys R Us, Target, Walmart, and Timberland, Li & Fung has benefited from American outsourcing. In 2009, for example, Fashion company Liz Claiborne sold its manufacturing operations to Li & Fung Group for $83 million. The Romneys invested around $15,000 and made just over $1,000. WATCH: Mitt Romney’s Bain Employees Gone Wild!